The Chinese zodiac calendar is comprised of 12 animal signs. The last astrological sign of the Chinese zodiac calendar is the Wild Boar or Pig. You a “Wild Boar/Pig” according to Chinese astrology if you are born in one of the following years: 1935, 1947, 1959, 1971, 1983, 1995, 2007, or 2019. 2019 is the year of the Boar or Brown Earth Pig. People born in the Year of the Pig are thought to be courageous, family oriented, smart, considerate, responsible, independent, devoted, joyful, and friendly. A person born under the sign of the Boar/Pig often takes up a profession of service supporting others, such as, a teacher, philosopher, social worker, scientist or engineer, creative artist or writer. The Year of the Pig is considered to be a beneficial time period for personal advancement. The Year of the Pig is highly conducive to learning new skills or using your time for personal betterment or volunteer work, particularly for family support agencies, farm animal welfare groups, or community gardening. The Year of the Pig is also supportive for taking “inventory” and finding balance in your life. Organize and assess what resources you have and make plans for the future. 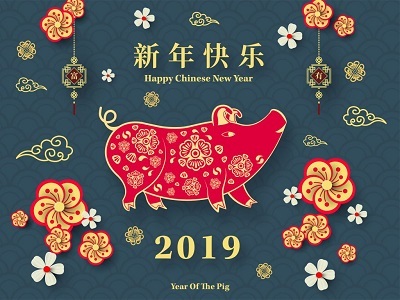 The Year of the Pig is thought to be an auspicious year because the boar/pig attracts success, joy, friendship, love, and abundance into your life. A water sign, Pig is known for its friendly, easy going attitude, energetically going with the flow, imaginary thinking and lucid dreams, and openness to new beginnings. Pig totem energetically resonates with the season of winter, and is most active during the early morning or evening hours. Pig/boar totem may offer support to energetically change lazy behaviors, overcome procrastination, and give one an appreciative attitude and zest for living fully and with joy. Pigs are social, inquisitive, smart and independent animals that love to explore and discover amazing food delicacies as they venture along. The pig/boar totem would be perfect for an outdoor enthusiast, foodie, or traveler. In natural circumstances, the pig social structure is based on matriarchal herds and their offspring. Pig/boar totem represents the divine feminine and may be supportive for female oriented households or multi-generational family living situations. Pig/boar totem energetically supports feelings of devotion and love in relationships with self, partners, family, and the community. In healing, Pig totem may be helpful for those with skin issues and body temperature challenges. Vulnerable in hot weather conditions, Boar/Pigs seek shade and wallow in mud or water because it is cooling for their skin and system. Pigs do not have sweat glands instead, they regulate their thermal heat levels through respiratory evaporation via their snouts. Due to the pig’s human-like, sparsely haired skin, the coating of mud serves as a sunblock, as well as, acts like a deterrent for flies and biting insects. Boar/Pig Totem may be supportive for those healing from too much sun or as relief from bug bites. Pigs love to be scratched and will rub their bodies and faces against posts, tree trunks, wooden fences, etc. Pig totem may be helpful for those with skin issues and diseases, topical sensitivity, itchiness, mange, blisters, etc. Perfect for the Year of the Pig, Ruby is a wonderful crystal for encouraging one to “follow their bliss” and to DO what they LOVE in life. Ruby is an excellent crystal for increasing life force energy, overcoming exhaustion, lethargy, and procrastination. Ruby is a sociable stone that attracts sexual activity through its stimulation of the base chakra. Ruby encourages passion for life but never in a self-destructive way. 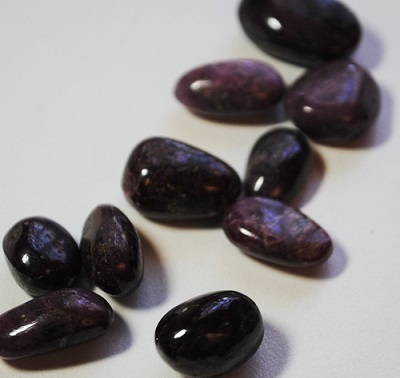 Ruby improves motivation and energetically gets “things going.” Ruby is also a protective crystal, offering strength during disputes or controversy. Ruby encourages one to step forward and speak the truth for those who may be threatened. Ruby stimulates the Pineal gland promoting lucid dreaming and clear visualization. Ruby is a crystal of courage, dispelling doubt and fears of the unknown while releasing feelings of anxiety. Ruby inspires one to be who they are supposed to be. In alignment with the energies of Year of the Pig, Ruby resonates with the vibrations of abundance, passion, courage and vitality. Snakeskin Agate is another crystal ideal for energetic support during the Year of the Pig. Snakeskin Agate promotes feelings of inner peace and acknowledgement of the JOY that may be found in one’s life. Snakeskin Agate may be helpful in eliminating mundane worries and concerns. Snakeskin Agate facilitates movement of energy and is an empowering crystal tool providing strength and endurance during times of activity. Like a boar/pig looking for truffles or other buried food sources, Snakeskin Agate may be helpful to find lost “things." Exercise your intelligence with Snakeskin Agate, as this crystal may be helpful in providing insight to solutions and is excellent for those who like to solve puzzles and mysteries. Snakeskin Agate also may provide insight to the character of others. 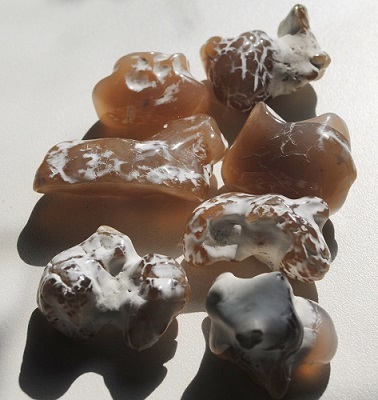 In healing, Snakeskin Agate may be used in the treatment of skin issues. 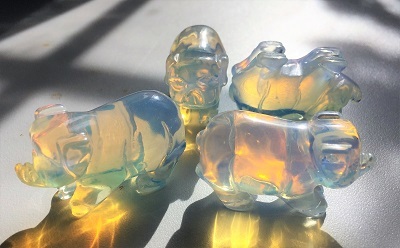 Resonating with the energies of abundance, Citrine is a powerful manifestation crystal to use during the Year of the Pig. Citrine attracts resources, wealth and prosperity, success in endeavors and awareness of the opportunities of new beginnings, as well as, it generates the endurance and perseverance necessary to take ideas/projects to completion. 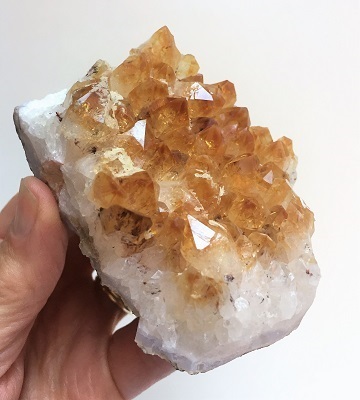 The energetic vibration of Citrine awakens the higher mind, promotes enjoyment, and creates an inner calm all areas of life. Citrine stabilizes the emotions, dissolves feelings of anger, and encourages a bright outlook on life. Citrine may be a useful crystal tool for smoothing group or family discord. Citrine helps one to get to the source of an obstacle and facilitates a quick solution. Citrine enhances concentration and revitalizes the mind. Citrine is empowering with energetic vibrations fueling imagination for creativity, thought clarity and “aha” moments of inspiration.